People discuss ideas about dealing with the opioid epidemic during the One Life Project event at the Bangor Arts Exchange Wednesday. Chipping away at the stigma that blocks too many people addicted to drugs and their loved ones from seeking recovery options emerged as the priority Wednesday in a gathering that included three candidates for governor. Maine’s opioid addiction crisis is claiming an average of more than one life per day, and killed 418 Mainers in 2017. Bangor Daily News Maine Focus Editor Erin Rhoda, who organized the event, said the intent was to put the responsibility for solutions on everyone. Attendees included counselors, doctors and law enforcement officers, most of whom have experienced personal loss to addiction. According to Pat Hickey of Bangor, a board member for the Bangor Area Recovery Network, the losses aren’t always directly due to overdoses. Her son was in recovery in 2004 when he died from suicide. She said shame about his illness stopped him from receiving the treatment he needed. In addition to a number of medical, law enforcement and addiction treatment professionals from Greater Bangor, three of the four gubernatorial candidates attended. Independents Alan Caron and Terry Hayes, along with Democratic nominee Janet Mills, participated in group discussions and later addressed the crowd of about 75, which gathered at the Bangor Arts Exchange. Republican nominee Shawn Moody initially committed to attend but recently bowed out because of an event unveiling his campaign advertisement on a NASCAR team’s race car in Arundel, according to organizers. His campaign spokeswoman, Lauren LePage, spoke on his behalf. In brief closing remarks, the candidates called for a widespread and comprehensive response, and were loath to discount anything that could help. “The simple reality is that we have to do all of these things, not some of them,” Caron said. Hayes agreed, calling for substantial and sustained state funding to supplement federal money. “We’re going to have to spend money on this and it’s your money we’re going to spend,” Hayes said. LePage said Moody supports attacking an underlying cause of addiction: mental illness. “He believes that is the linchpin,” LePage said. Mills said the very highest priority should be expanding Maine’s Medicaid program so more people would receive financial support for the treatment they need. “That’s what I personally want to hear from every candidate for governor,” Mills said. 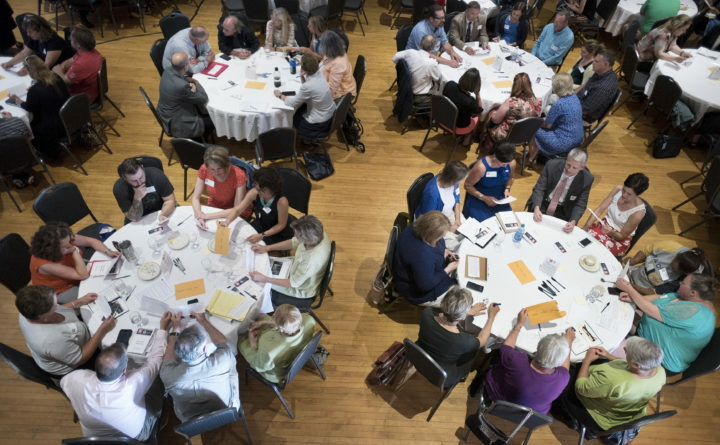 The list of 17 priorities generated Wednesday will be forwarded to the Bangor-area Community Health Leadership Board, which is already involved to some degree with each of the initiatives. A range of initiatives received strong support. Among the local-level ideas, the most votes went to the development of programs to prevent youth drug use, expanded access to treatment and stronger programs that support people in recovery. At the state level, more funding for treatment was the easy winner, followed by providing safe and affordable housing for people in recovery, and diversion programs that focus on treatment and recovery instead of involvement the corrections system. Anthony Ng, chief medical officer at Acadia Hospital in Bangor, said he viewed the event as an important networking opportunity and said such discussions involving professionals across disciplines are valuable.